When I was pregnant with my second child, Sofia, I went to a doctor who is known to be very good in his field and for his stringent weight control on his patients. True enough, on our first meeting, he told me that I was allowed to gain only one kilo a month and no more than that. Period. No excuses. This allowance for weight gain is quite standard because I was given the same by a different doctor with my first child. On my fourth month, I gained 2 kilos in one month even if I lost a kilo prior to that. So 4 kilos for 4 months was acceptable, wasn't it? Not for my doctor. I sat through a sermon of proper dieting. Eat the carbs at lunchtime because you can burn them during the day. The meat has to be eaten at night because you don't need to burn it but the baby needs it for formation. Vegetables & fruits are encouraged as much as I want. It was one quick lesson I learned about eating healthy that even if I am not pregnant anymore, I still apply it to my home cooking. The main square of Boville Ernica. My family life is pretty transparent. Weekdays are usually uneventful and on weekends, when weather permits, we take day trips outside Rome. Not only do my husband and I push for healthy eating, we also try to nurture our knowledge about what's around us. This goes to the kids too because it's a chance for them to see new things, meet new people, try different food, stay together as a family and the most fundamental of all, play in the playgrounds of all the towns we visit. No tour is complete until we get to know the play area too. 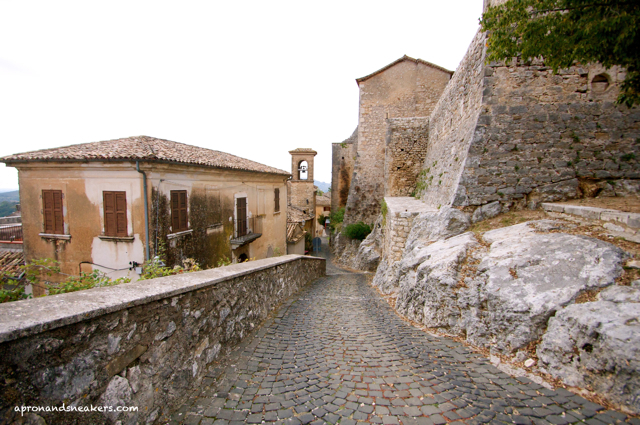 I refer online to I Borghi piu' Belli d'Italia (Most Beautiful Villages of Italy) or from the Italian regional travel books of Touring Club Italiano to choose a place to go to. This series of travel books is the only one I trust because it has a very serious reputation, dating back in the late 1800s done by bicyclists to promote cycling & traveling. I have bought other travel books before but I always end up using Touring Club anyway so I decided to stop wasting my money & time in poring over the pages of useless guidebooks. The guidebooks are only in Italian and I think they came out with their first English edition sometime ago. 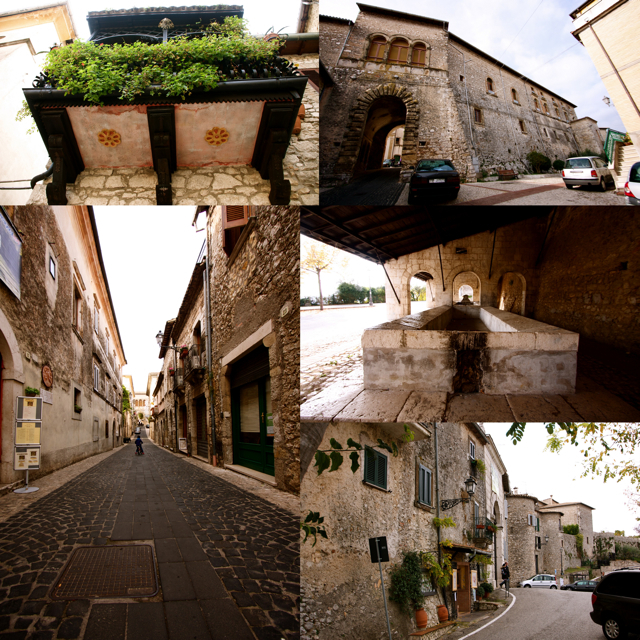 Referring to I Borghi piu' Belli d'Italia, let me introduce the three towns in Lazio that we visited last weekend. 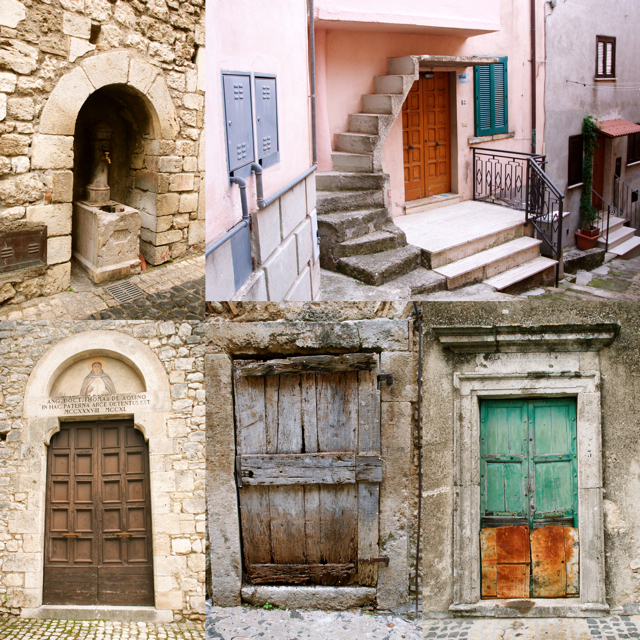 Two of them are in the list of the most beautiful villages, namely, Boville Ernica and Monte San Giovanni in Campano. 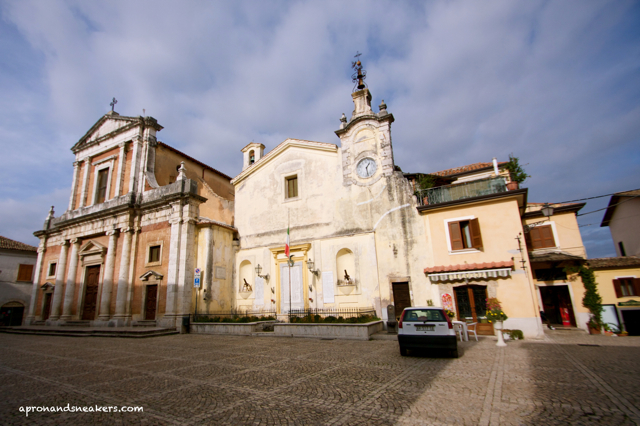 The third, Veroli, beautiful in its own right, has a remarkable church and piazza (square). Boville Ernica's history dates back from pre-Roman times. It was moved from the plains, underneath its present position, to a much higher position in the mountain and fortified with walls after two big invasions in the 9th & 10th centuries. It has a lot of archeological finds like the pre-historic Pelasgic walls. Aside from this wall, there are also a number of churches to visit, which were all closed when we were there. The town still has its medieval walls with 18 turrets still intact. 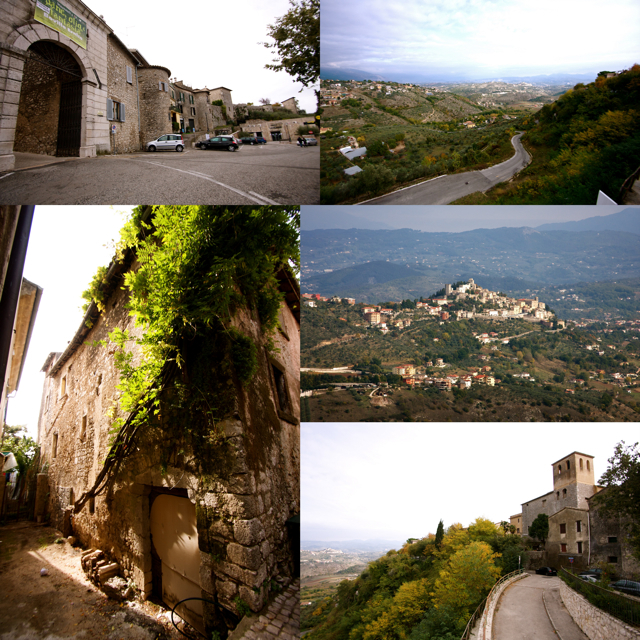 The other town nearby that's also in the list of the most beautiful villages is Monte San Giovanni in Campano. It also maintains a high position like Bovile Ernica and also boasts a landscape of olive trees as you go up to the town. This town has a certain quaintness that I liked. On foot towards the castle on top of the town, we weaved through cobblestoned deserted alleys with old buildings on both sides. 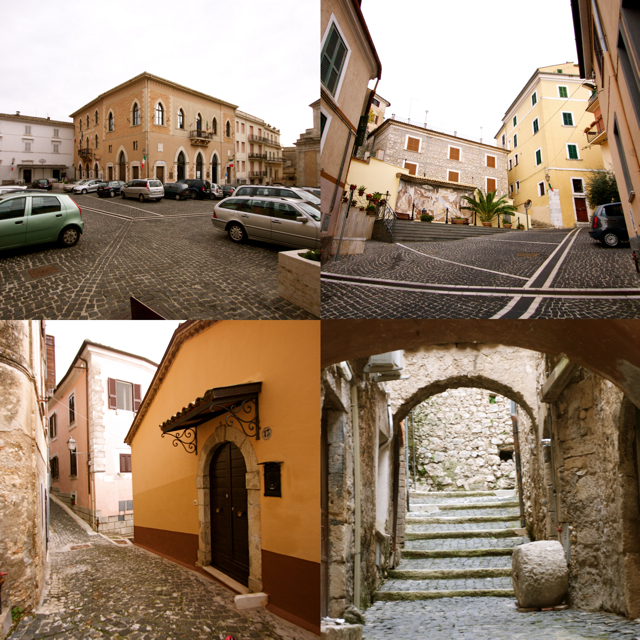 Quite typical of any old village in Italy and it was a pleasant walk up. 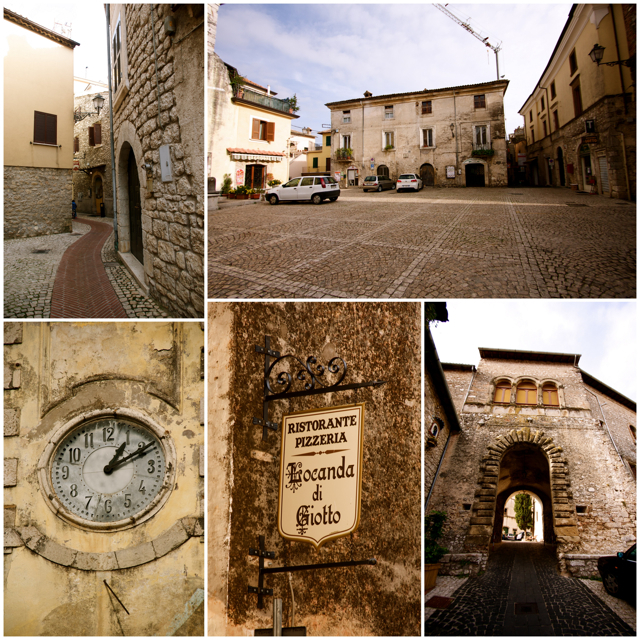 Historically, this town is known as the place where Thomas of Aquinas was imprisoned for two years by his family. It's the first door on the lower lefthand corner. 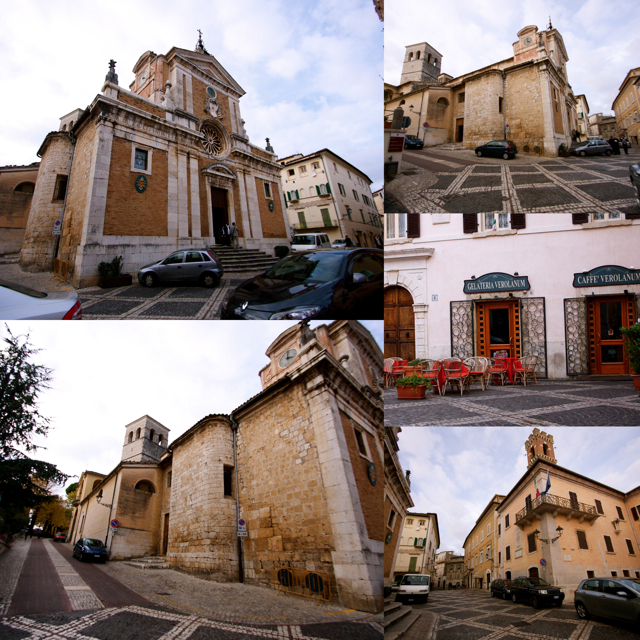 In Veroli, we stopped at its main square that is dominated by its cathedral. Truth be told, by the time we arrived in this town, it was getting dark at 4 PM and I had to take a quick trip to the pharmacy to get Sofia a pacifier for our car trip home to make up for the one I forgot at home. A crying toddler for a two-hour ride home is something no one wants. 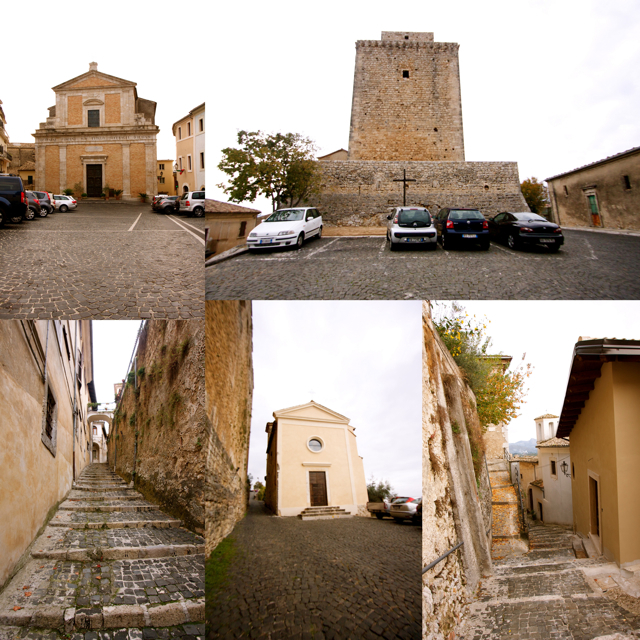 In the guidebook, there is an interesting part of the town called Rocca di San Leucio that is situated at the highest point of the town but it was getting too dark. We left it as something to see in the future but if you are curious about it, click here. 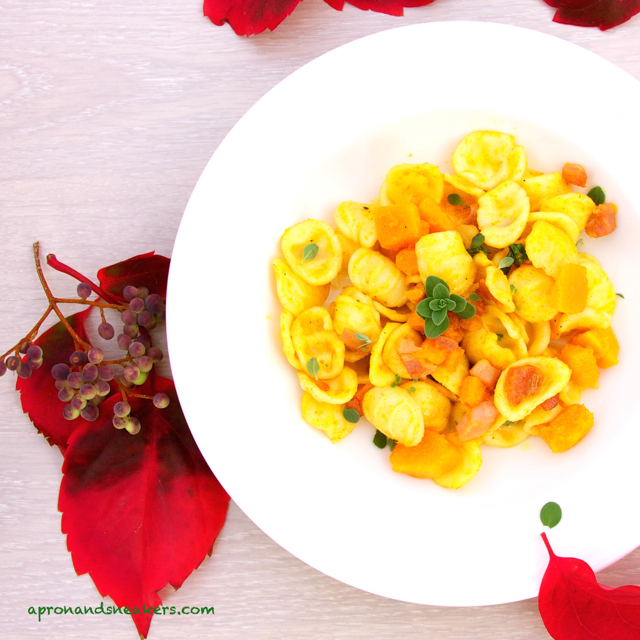 Fill up the cooking pot with a lot of water for boiling the pasta and squash. 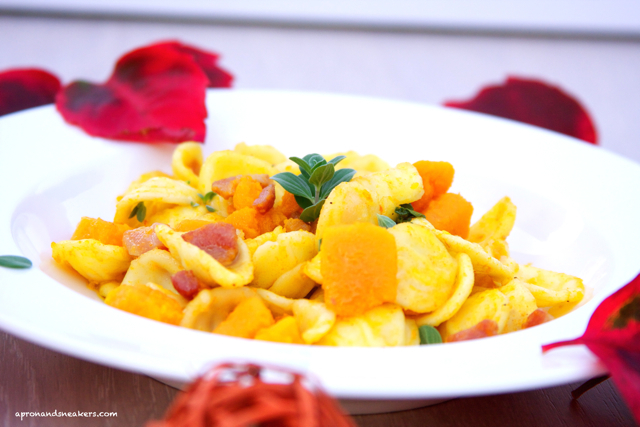 When the water boils, add some salt and put the pasta & the squash together in the water. Cook following the cooking time suggested in the packaging of the pasta. Lessen 3 minutes of the cooking time of the pasta. Drain both pasta & squash. Do not throw the water yet just in case it is needed for the sauce. Meantime, while cooking the pasta & the squash, prepare a non-stick saucepan. When it's warm, add the pancetta then toast. Add the cooked pasta & squash in the saucepan with pancetta. Toss all the ingredients together for 3 minutes. If it becomes too dry, add a very little amount of water used for cooking the pasta. Season with pepper. Check if it still needs salt because pancetta is already salty. Sprinkle with fresh thyme. Drizzle with extra virgin olive oil. On the plate, sprinkle with the grated ricotta salata.